Still in the box but not great condition on the box---what is pictured is included--check for anything missing--SOLD AS IS! Act fast on this one! This is a great sealed inside model kit Fantastic Piece. Condition: New Sealed. Model: 48658. Here is the Polar Lights 2003 reissue of the Aurora Spider-man kit. This model has been "Upsized" from the original. I think this is 1/8 scale compated to the original 1/10. Theres a small window on the bottom of the box revealing the kit is molded in white. U.S. buyers only please and I can only except Paypal. Uyer pays return shipping and the kit must be still sealed. Thanks for looking. This is a New in open Box Spiderman 40736 Marvel glue together Level 2 model kiit. This was never assembled. Good luck. HERCULES PRINCE OF POWER SON OF ZEUS. RESIN MODEL KIT RELEASED BY KOMA KITS MANY YEARS AGO SCULPTED BY SHAWN NAGLE. STANDS 12.5" TALL. mace is included but not shown in painted pics.Kit color may be lighter or darker or different color than shown.RARE MODEL KIT. The box has a couple of very minor dents and the yellow on the box art has faded but contents should be mint. 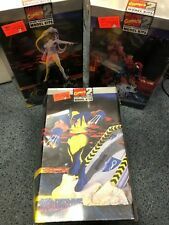 Model is still factory sealed in the original plastic and in excellent condition. The kit is sealed and was released in 2003. 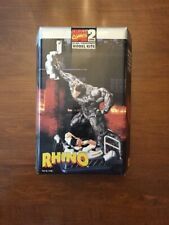 Marvel Machines Spider-Man's Web Runner Snap Together Model Kit NIB. Condition is New. Shipped with USPS First Class Package (2 to 3 business days). The box has some rough edges as shown by the pictures. Non-smoking home. The Amazing Spider-Man 2003 Polar Lights Model Kit, Model # 4100. New Sealed In Box, Great New Item. Killer Art! I have been dealing in toys and other collectable's for over 20 years. Professionally painted by an Award winning make up artist and painter. You are looking at a original issue 1974 Aurora model of THE Amazing Spider-Man. The rest of the kit is never assembled. Very nice original comic book with instructions and what can possibly be a back drop to completed model. Aurora Model B/U 1966 Spiderman Spider-Man ORIGINAL Build Up. When Aurora released the Comic Scene series, they reissued many of the most popular Super Hero kits they had produced in the 1960s. Expect them. 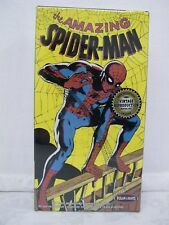 ToyBiz Marvel Spider-Man Model Kit Vintage 1996 sealed package! Hot Colors & Super Hero Graphics. Pre-Painted, Snap Together Plastic Model Kit. No Paint or Glue Required. Crayola 3D Paint 'Ems Spider-Man 2, Doc Ock and Spider-Man mini busts. 2 paintable mini busts, water color paints, & 2 brushes. Each model is accurate down to the most minuscule details. We apologize for the inconvenience. If you’re looking for further detail, you might want to check the manufacturer or publisher website. A complete tool kit that includes two pairs of pliers and a clipper is availablehere. 1/6th Scale Vinyl Model. The Amazing. THIS IS A MODEL THAT MUST BE PUT TOGETHER AND PAINTED. CHEERS, CHRIS. Miniature — Easy to assemble. 3D Laser Cut Models. Simply pop out the pieces and connect using tabs and holes. One 4” x 4” full color steel sheet. 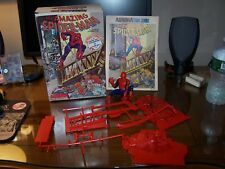 The Amazing Spider-Man Snap Model Kit Marvel Comics NO GLUE NEEDED!! The model can be displayed on the supplied base or hung on the wall in a cool Spider-Man pose. Snap assembly, no glue or paint required. NO GLUE REQUIRED! The Amazing Spider-Man Snap Model Kit. Easy snap together assembly. SPIDER MAN KIT, SEALED, NICE, RARE ! Year released 1966. This kit is a 2003. Mint in box. Marvel Science Spider-Man Web Creator Lab. Create AMAZING Webs Like Spider-Man! All-inclusive web lab and Re-usable web gel! Make 4 different kinds of Spider-Man webs. This item is new in box, and in good condition as pictured. Product ships USPS Priority Mail within 24 hours of payment.